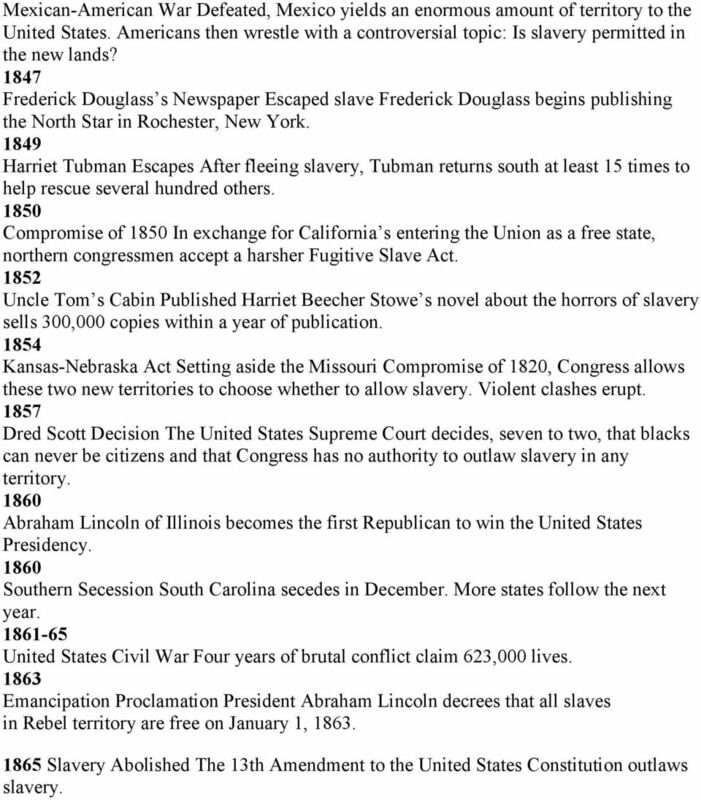 Download "TIMELINE OF SLAVERY IN AMERICA 1501-1865 1501 African Slaves in the New World Spanish settlers bring slaves from Africa to Santo Domingo (now the"
2 Virginia passes a fugitive slave law Charles II, King of England, orders the Council of Foreign Plantations to devise strategies for converting slaves and servants to Christianity Hereditary Slavery Virginia law decrees that children of black mothers shall be bond or free according to the condition of the mother Massachusetts reverses a ruling dating back to 1652, which allowed blacks to train in arms. 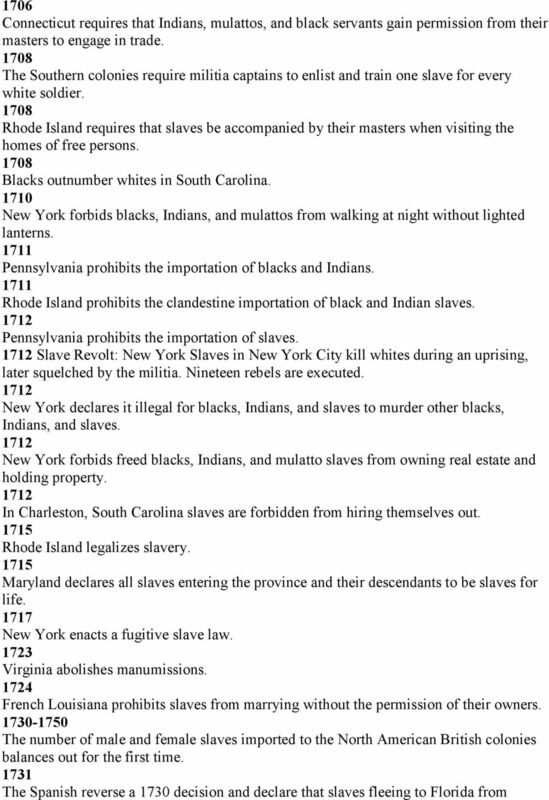 New York, Connecticut, and New Hampshire pass similar laws restricting the bearing of arms In Gloucester County, Virginia the first documented slave rebellion in the colonies takes place Maryland legalizes slavery Charles II, King of England, gives the Carolinas to proprietors. Until the 1680s, most settlers in the region are small landowners from Barbados New York and New Jersey legalize slavery Maryland is the first colony to take legal action against marriages between white women and black men The State of Maryland mandates lifelong servitude for all black slaves. New York, New Jersey, the Carolinas, and Virginia all pass similar laws Maryland passes a fugitive slave law Virginia declares that Christian baptism will not alter a person's status as a slave New Jersey passes a fugitive slave law The State of Virginia prohibits free blacks and Indians from keeping Christian (i.e. white) servants New York declares that blacks who convert to Christianity after their enslavement will not be freed In Virginia, black slaves and black and white indentured servants band together to participate in Bacon's Rebellion The State of Virginia forbids blacks and slaves from bearing arms, prohibits blacks from congregating in large numbers, and mandates harsh punishment for slaves who assault Christians or attempt escape Virginia declares that all imported black servants are slaves for life. 3 1684 New York makes it illegal for slaves to sell goods The Pennsylvania Quakers pass the first formal antislavery resolution Virginia passes the first anti-miscegenation law, forbidding marriages between whites and blacks or whites and Native Americans Virginia prohibits the manumission of slaves within its borders. Manumitted slaves are forced to leave the colony South Carolina passes the first comprehensive slave codes Rice cultivation is introduced into Carolina. 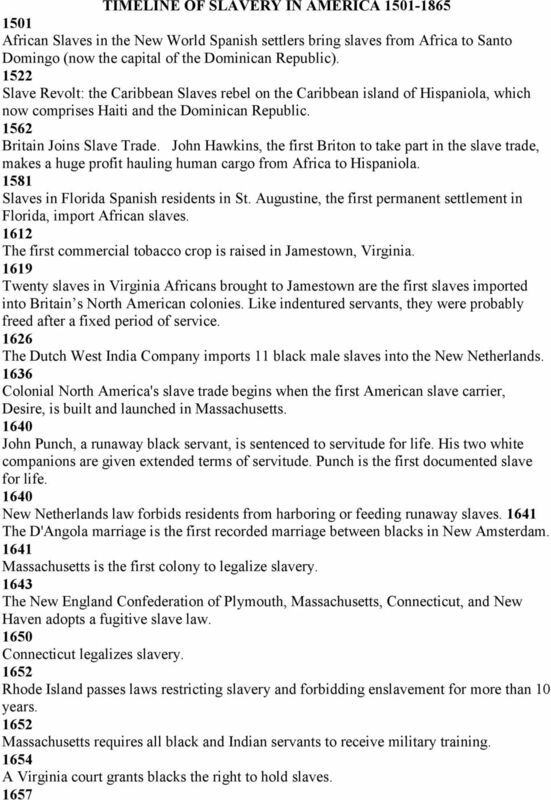 Slave importation increases dramatically The Royal African Trade Company loses its monopoly and New England colonists enter the slave trade Pennsylvania legalizes slavery New York passes An Act for Regulating Slaves. Among the prohibitions of this act are meetings of more than three slaves, trading by slaves, and testimony by slaves in court Massachusetts requires those masters who liberate slaves to provide a bond of 50 pounds or more in the event that the freedman becomes a public charge Connecticut assigns the punishment of whipping to any slaves who disturb the peace or assault whites Rhode Island makes it illegal for blacks and Indians to walk at night without passes Slaves as Property Describing slaves as real estate, Virginia lawmakers allow owners to bequeath their slaves. The same law allowed masters to kill and destroy runaways The Virginia Slave Code codifies slave status, declaring all non- Christian servants entering the colony to be slaves. It defines all slaves as real estate, acquits masters who kill slaves during punishment, forbids slaves and free colored peoples from physically assaulting white persons, and denies slaves the right to bear arms or move abroad without written permission New York declares that punishment by execution will be applied to certain runaway slaves Massachusetts makes marriage and sexual relations between blacks and whites illegal New York declares blacks, Indians, and slaves who kill white people to be subject to the death penalty. 8 Mexican-American War Defeated, Mexico yields an enormous amount of territory to the United States. Americans then wrestle with a controversial topic: Is slavery permitted in the new lands? 1847 Frederick Douglass s Newspaper Escaped slave Frederick Douglass begins publishing the North Star in Rochester, New York Harriet Tubman Escapes After fleeing slavery, Tubman returns south at least 15 times to help rescue several hundred others Compromise of 185 In exchange for California s entering the Union as a free state, northern congressmen accept a harsher Fugitive Slave Act Uncle Tom s Cabin Published Harriet Beecher Stowe s novel about the horrors of slavery sells 300,000 copies within a year of publication Kansas-Nebraska Act Setting aside the Missouri Compromise of 1820, Congress allows these two new territories to choose whether to allow slavery. Violent clashes erupt Dred Scott Decision The United States Supreme Court decides, seven to two, that blacks can never be citizens and that Congress has no authority to outlaw slavery in any territory Abraham Lincoln of Illinois becomes the first Republican to win the United States Presidency Southern Secession South Carolina secedes in December. More states follow the next year United States Civil War Four years of brutal conflict claim 623,000 lives Emancipation Proclamation President Abraham Lincoln decrees that all slaves in Rebel territory are free on January 1, Slavery Abolished The 13th Amendment to the United States Constitution outlaws slavery.